This event is FREE to job-seekers and open to the public. For a list of employers who will be present, visit Yazoo County Area Job Fair 2018. 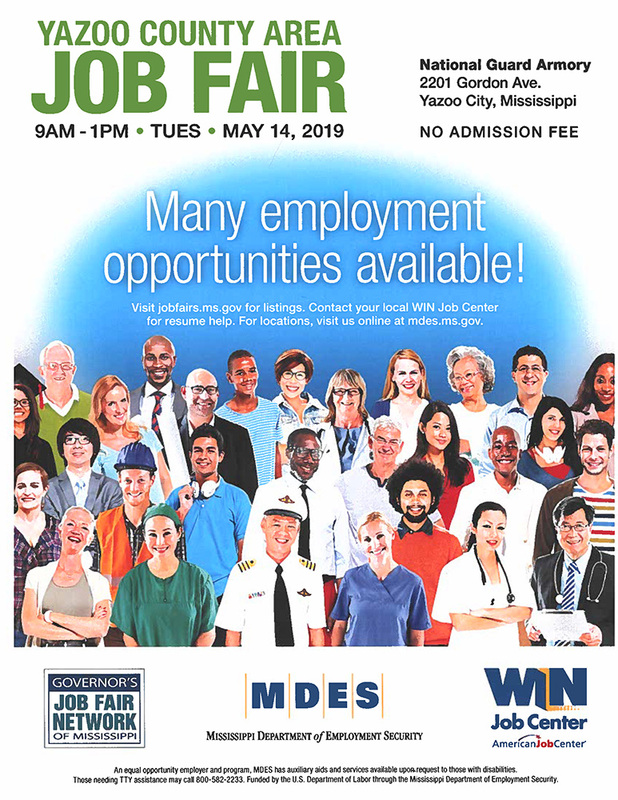 YAZOO CITY, MS – If you are looking for a job, you should attend the Yazoo County Area Job Fair from 9:00 a.m. to 1 p.m. Tuesday, May 14, 2019, at the National Guard Armory, 2201 Gordon Ave, Yazoo City. This job fair will provide you with access to employers seeking talented candidates in many disciplines, from social services, fabricating, welding, administration, accounting, food service, and much more. Many local employers and employment resource organizations will be participating in the event. No pre-registration is required for job seekers. Admission to the event is free. “As Governor, it is my duty to ensure that our state is doing all it can to create an environment that produces secure employment opportunities for Mississippians. The Governor’s Job Fair Network was created as an avenue to place Mississippi’s most attractive resource – our people – in front of business and industry. By facilitating connections between job seekers and employers who have real positions to fill, this self-sustaining program helps Mississippians invest in their futures,” says Mississippi Governor Phil Bryant. The Governor’s Job Fair is a community sponsored one-day event that brings together a diverse group of employers actively looking for employees. Each Job Fair is FREE and open to anyone looking for a job. Employers are assembled to offer real job opportunities to those individuals looking for employment. The Job Fair is distinguished from a career day in that job placement rather than career exploration is the main objective and expected outcome. From the Bank of Yazoo to the Mississippi Department of Human Services, there will be a wide variety of employers at the fair to meet many desired fields of employment. For a full listing, visit www.jobfairs.ms.gov. The Yazoo County Area Job Fair is a part of the Governor’s Job Fair Network and is sponsored in part by the Office of the Governor, the Mississippi Department of Employment Security, and WIN Job Center. Employers interested in more information should also visit www.jobfairs.ms.gov. The Yazoo County Fair is at the Yazoo County Fairgrounds located on Hugh J McGraw Drive in Yazoo City, Mississippi. The page you have commented on refers to the Yazoo County Area Job Fair that is held annually in May, usually at the MS National Guard Armory on Gordon Avenue in Yazoo City.